The management of pain continues to challenge health care providers and the health care system with high direct expenditures for medical care and medication related to pain and the indirect costs associated with lost productivity in the work force. This has contributed to a “pain crisis in America” (Meghani et al., Pain Med, 13, 150–174, 2012, p. 150) and resonates globally. Researchers report community populations may have a pain prevalence as high as 40 % noting minority members are overrepresented and more frequently undertreated (Mossey, Clin Orthop Relat Res, 469, 1859–1870, 2011). Hispanic populations may present unique considerations that derive from the diversity of multinational backgrounds with strongly held values and beliefs and cultural perspectives. 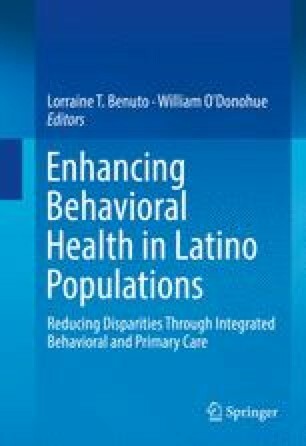 The purpose of this chapter is to explore the pain management experience of Hispanic populations, examine a quality improvement approach, and propose evidence-based integrated care solutions for more effective approaches. Agency for Healthcare Research and Quality (AHRQ). (2015). Pain guidelines. Retrieved July 20, 2015, from http://www.guideline.gov/search/search.aspx?term=pain+guidelines. American Pain Society. (2001). Pain: Current understanding of assessment, management and treatments. American Pain Society and National Pharmaceutical Council. Retrieved from http://www.npcnow.org/system/files/research/download/Pain-Current-Understanding-of-Assessment-Management-and-Treatments.pdf. Cleland, C. (2009). Brief pain inventory. Retrieved from http://prc.coh.org/pdf/BPI%20Short%20Version.pdf. International Association for the Study of Pain. (2012). IASP taxonomy. Retrieved from http://www.iasp-pain.org/Taxonomy?navItemNumber=576. Wong-Baker FACES Foundation. (2015). Wong-Baker FACES ® Pain Rating Scale. Retrieved September 19, 2015, with permission from http://www.WongBakerFACES.org. World Health Organization (WHO). (2012). Treatment guidelines on pain. Retrieved July 20, 2015, from http://www.who.int/medicines/areas/quality_safety/guide_on_pain/en/.